Lock maker Schlage recently updated its iOS app to introduce compatibility between the company's Schlage Sense Smart Deadbolt and Apple's new Home app in iOS 10. Once users update the Schlage Sense app in the iOS App Store, the smart deadbolt can be added into Home, and subsequently controlled via Control Center and voice commands through Siri. The update also brings push notifications whenever the deadbolt is locked or unlocked, and ultimately makes "it easier for users to keep an even closer eye when their lock is used," according to Schlage. Within the Schlage Sense app, users can manage access codes, change lock settings, view the last 100 times the lock was used, receive installation help, and contact customer service. An update to the Schlage Sense app is now available in the App Store which allows the Schlage Sense lock to work in tandem with iOS 10’s new Home app. 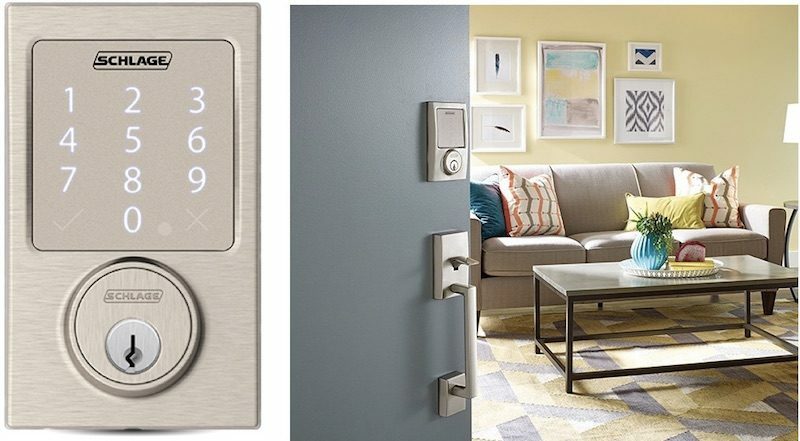 This integration provides users with a centralized platform to access their favorite HomeKit-connected devices alongside their Schlage Sense deadbolt. Through this update, all iOS users (9.3 and above) will also receive push notifications when their deadbolt is locked and unlocked. These updates make it easier for users to keep an even closer eye when their lock is used. I've had this lock a few months and it is a bit pricey, but well worth it. My mom watches my son some days and she can get in with a code, i have a code for our cleaning person that only works a certain day and time, and of course i can tell if i locked my door while im in bed to save me from getting up to check. Wow, somebody needs to tell Schlage when it makes sense to use touch and when it makes sense to use buttons. Also, this is crazy ugly. Not sure what you mean by this. I have this lock and the keypad works perfectly. I have tried several smart locks and this one is the best by far. The Kwikset Kevo is the most unreliable of the bunch, and a complete piece of trash. The August has a pretty neat auto-unlock feature that is supposed to unlock it when you get close, but it's very flakey. This one is the most flexible, as you can use either a key, a code, the app, Siri, and even auto unlocking when you arrive home via Homekit. Also a good sign that they updated their firmware to support Home so quickly after the iOS 10 release. Have you tried, or heard anything, about Kevo v2? I just got one, but am thinking I should maybe get this Schlage instead. I really wanted it to work with my Apple Watch, but apparently Kevo doesn't unlock with the Watch. ...A keypad with touch is not for outdoor use. Actually, yes, the keypad with touch is for outdoor use. It works very well from my personal experience with the non Apple version. Is it an in door lock? A keypad with touch is not for outdoor use. It's not a capacitive touch screen if that's what you're thinking. They are actually shallow little buttons that you can press through gloves and such. why a touchpad though? I would put real buttons so that when batteries run out you can still access your door or something. Schlage specifically used the type of touchpad that they use on the Sense locks for a particular reason. To prevent being able to guess the code when the keypad buttons wear down over time, and shows what keys are being pressed. The touchpad is also fingerprint resistant for the same reason. I had the non-Homekit compatible version of the lock before this one and battery life is amazing. Over a year, and the lock warns you well in advance that the battery is getting low. Is there a cheaper alternative to this? Like, $30? If not... maybe I should just build one myself. Seems like a fun and easy project. This lock is awesome. I love it. I never use the keypad. When I get home I simply tell Siri via my watch to unlock my door. Although HomeKit enabled sounds great for my personal needs, I am currently on the lookout for a great lock that integrates with Airbnb. Does anyone have actual experience with one that they would recommend? That's the point of still having a keyhole. I still carry my key around in case I need it, but I generally don't. The bolt is motorized both when using the keypad and when using homekit/remote/automation. It has a manual backup via both the key and via the inside manual dial. Mechanical keys like you describe wouldn't allow you to also enable programatic use of the keypad (say, enabling an individualized code for the cleaning lady or a contractor that expires after so long). The mechanical code has to be manually set and changed at the lock.